As I walk into an assembly at my old school with a prefect, a slip of a girl who is 40 years my junior, the emotion of the occasion makes it hard for me not to cry. It’s International Women’s Day 2019 and behind me is a long line of Old Girls. I’ve been invited to talk to years 9, 10 and 11, with the aim of inspiring them and tackling ‘confidence issues’. This is a prestigious independent school in Greater Manchester. When I attended here the local authority paid for my education, as I came from a modest background. For those seven years I felt outclassed by fellow students destined for Oxbridge. Now a mixture of feelings washes over me – pride as a Queen’s Nurse being invited back to this event, and the old familiar ‘imposter syndrome’. I’m deliberately wearing the armour of my best dress, heels and QN badge, so no one will know how I feel. The local bursary scheme for the school still offers an opportunity to students whose parents can’t afford the fees, and I wonder how many here today feel the way I did all those years ago. The event also triggers more recent memories, of rural Lincolnshire, one of the most divided places I’ve ever worked in. It was 2014 and I was working for the University of Exeter on an asset-based community development programme called Connecting Communities. My mind flashes next to 2015 and a project called Dadly Does It, in Salford, Greater Manchester, helping fathers to help each other and their children. I was part of a social enterprise funded by a clinical commissioning group. I remember talking to a mother from Salford who wanted to set up a baby massage group for other local parents, so she could listen informally and signpost them to help, based on her own vast experience as a working class parent. 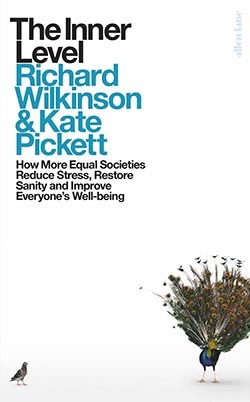 Epidemiologists Richard Wilkinson and Kate Pickett’s book The Inner Level (pictured), published in 2018, talks about the actions that we take to defend ourselves from feelings of inferiority, such as buying the latest gadgets, whether we can afford it or not. It is a sequel to their 2009 book, The Spirit Level, which argued that social comparisons are toxic to society. Both draw on statistically significant data to show that life expectancy, mental illness, violence and illiteracy around the globe are affected not by how wealthy a society is but how unequal it is. Inequality makes people lash out. It affects your emotional well-being. It makes you achieve less and hide more. The authors argue that harmful emotional and psychological environments fuel social anxiety, and that they warrant as much political and public attention as carcinogens in the environment and pollutants in the air we breathe. Public health nursing has to extend further than health education, promotion and protection if we are to tackle health inequalities. To do so we have to recognise the psychological environments that income inequality creates and the behaviours that ensue, and find new ways to work within them. These days I work for myself, on an asthma education programme I set up called BreathChamps. Despite my modest background, the impression I seem to create when I enter a low-income community and try to engage with residents is almost like a lion entering a field of antelopes. I’m told it’s because I’m a stranger, along with how I talk. Sometimes it helps to say I’m a nurse – people still hold nurses in high esteem, and they know that what they say to me is confidential – but at other times I’m seen as someone who will judge them and might have their children taken away. As a result I have learnt to do what I call ‘asset-based nursing’ – to treat citizens as assets. In 2017, while working on Dadly Does It, I went with a support worker, a father I’d met in the neighbourhood three years earlier, to a pub to meet other local fathers. At first the men wouldn’t talk about local issues – why they thought neighbours were stabbing each other or attempting to take their own lives, or why children as young as five were playing on the streets alone, and ten year olds were terrorising older people. But after several pints the men opened up and began to tell their stories of family strife and hidden terrors. This and other discussions in a community partnership meeting led eventually to a group of fathers setting up a recycling scheme for bicycles, and organising family bike rides and children’s cycling proficiency training. They asked for help from other fathers, who were often emotionally unwell, as a way of encouraging them to talk about their lives and be part of meaningful father-led activities. Then two fathers set up a community interest company and the police started donating stolen and unclaimed bicycles for renovation and sale. It’s still early days, but it’s a spark of hope. People will listen and open up to an experienced peer. For those on the poverty line, a peer is less of a threat than a nurse. My experience of communities leads me to believe that they are stuffed full of assets waiting to be uncovered and connected. I’m there to support peer working and to release – not build – capacity and capabilities. While others are assessing needs and delivering care, I’m working in a complementary way by supporting local people to look for strengths and skills in their neighbours. By asking citizens for help rather than giving it we encourage people to recognise positive things about themselves, something some have forgotten and sometimes, sadly, have never been told. I believe that communities know what they need in order to heal themselves. In a world of widening income inequality, nurses have to understand economics, in particular something called local wealth building. By procuring services as much as possible from within the local community we help build wealth by creating jobs. Good work means good health. Every nurse manager who works for a large organisation such as the NHS, a local authority or the criminal justice system, often called an ‘anchor institution’, has a role; big organisations have big purchasing capacity.